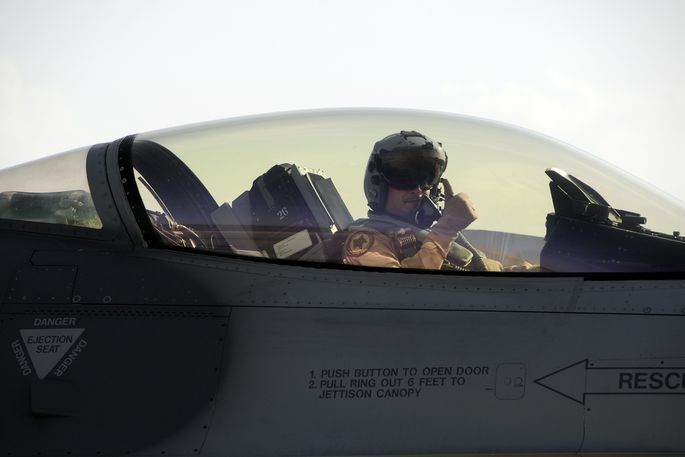 HomeMilitary AviationHere’s why F-16 pilots take the most stunning selfies. Such as this one. Thanks to the F-16’s bubble canopy, which lacks front frames, “Viper” pilots can take the most stunning selfies among fighter jocks. Here’s another epic self-portrait. It was taken by a Royal Norwegian Air Force pilot flying with the 332 Skv during an Exercise Cold Response 2014’s mission over Tromso fjord. You probably remember the famous “selfie” taken by a Danish pilot while firing an AIM-9 Sidewinder. The Lockheed Martin F-16 is equipped with a large single-piece bubble canopy which features no forward bow frame. The pilot sits on an elevated 30° inclined ejection seat (to improve G tolerance) that, combined with the bubble canopy, provide what is by far considered the best 360° visibility of any combat plane in the world. The perfect plane for cool “selfies”. By the way, GoPro cameras have taken this kind of photographs to a completely new level.